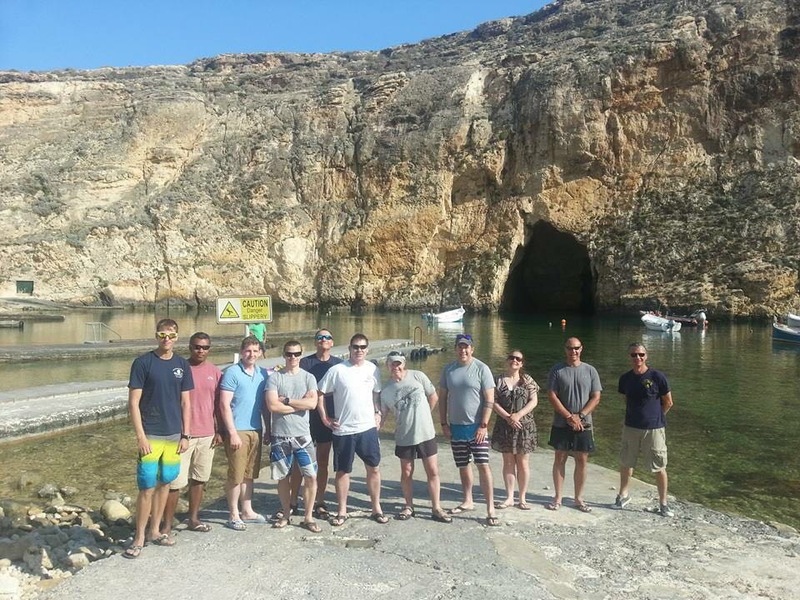 On the 4th June 2016 11 divers set off for the small Island of Gozo. The expedition was made up of various ranks from Private to Captain, all of whom were looking forward to progressing their diver training, refresh their skills or just get back in the water. My participation on the expedition came about due to working as a civilian aircraft maintenance fitter within an Army Air Corps Squadron. The 2IC of the squadron and I have known each other for well over ten years having served together whilst I was a REME aircraft technician in the regular Army (and had dived together on many expeditions previous). He asked if I would consider coming on the expedition as an instructor if my reserve unit agreed. As a serving Army reserve Combat Medical Technician ( CMT ) with 157 Regt Royal logistics corps in Cardiff, I approached my chain of command to request if this was possible. My unit appreciated the value of my attendance on the exercise and having had my attendance approved I was added to the nominal role. Mainly through my regular service I have progressed to British Sub Aqua Club (BSAC) Dive Leader and Open Water Instructor. Unfortunately since leaving the regulars time and opportunity has been limited to a few small day trips a year, so the expedition was a great way to get stuck back in. It would give me the opportunity to develop my diving skills and work towards the next qualification of Advanced Diver. Advanced Diver is a pre requisite for attendance on the Joint Service Sub-Aqua Diving Supervisors (SADS) course. A course I am keen to complete as this will allow me to facilitate training and expeditions for my own and other units. The team departed Luton airport for Malta where after an evening arrival and bus transfer boarded the ferry for the quick hop over to the small island of Gozo. Our stay for the duration of the trip was the small fishing village of Marsalforn where we would be diving under the guidance of the Calypso diving company. 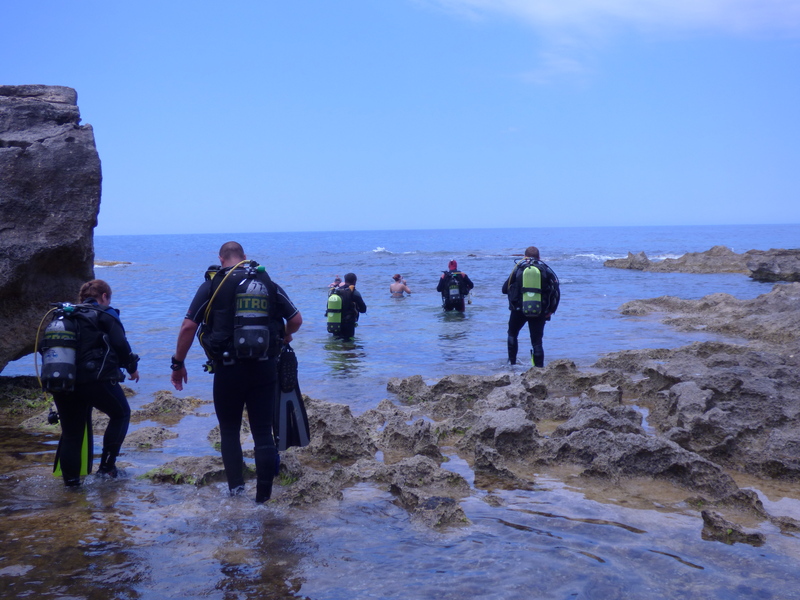 The main purpose of the trip was to progress 6 of the team members from BSAC open water divers to Sports Divers. Most of the 6 had only just in the week previous qualified as open water divers so were all fresh and ready for the challenges of the next few days. Other members of the team included someone who had completed significant training with another training organisation (PADI) and was looking to complete conversion training to allow him to progress under the BSAC scheme and myself hoping to progress my experience towards my Advanced Diver and further my experience towards my SADS course. The first dive of the trip the next afternoon was taken at the small and sheltered Xwenji bay. This was to be a shallow shakeout dive to test equipment and to ensure everyone was on the same page for some adventurous diving. 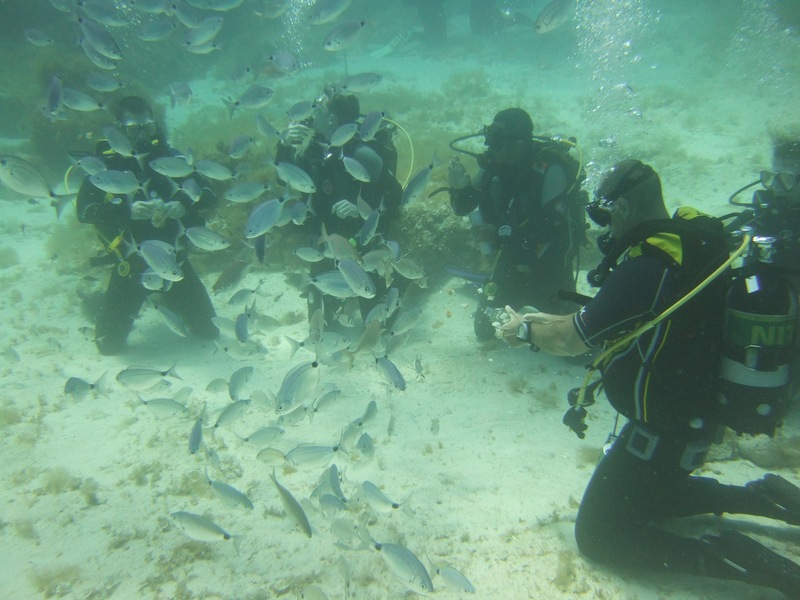 The next three day’s diving consisted of getting all the students through all the skills, drills and lessons needed to undertake their final assessments and exam. A number of theory lessons took place after the day’s diving, mostly fuelled by caffeine with the students soon realising that diving can be quite tiring, or perhaps it was the smooth tones of Dave’s delivery! Mid-way through the week with the written exam completed and the open water rescue skills test passed all the open water students were now fully qualified BSAC Sports Divers. This was not only a good thing for the students to achieve but also meant the last two days we could progress with some more challenging diving. On the Thursday of the trip we boarded en masse a local dive charter boat and left Marsalforn with the wreck of the P31 in our sights. The P31 was a former German minesweeper/ patrol boat decommissioned in 2004 and bought by the Maltese tourism authority. 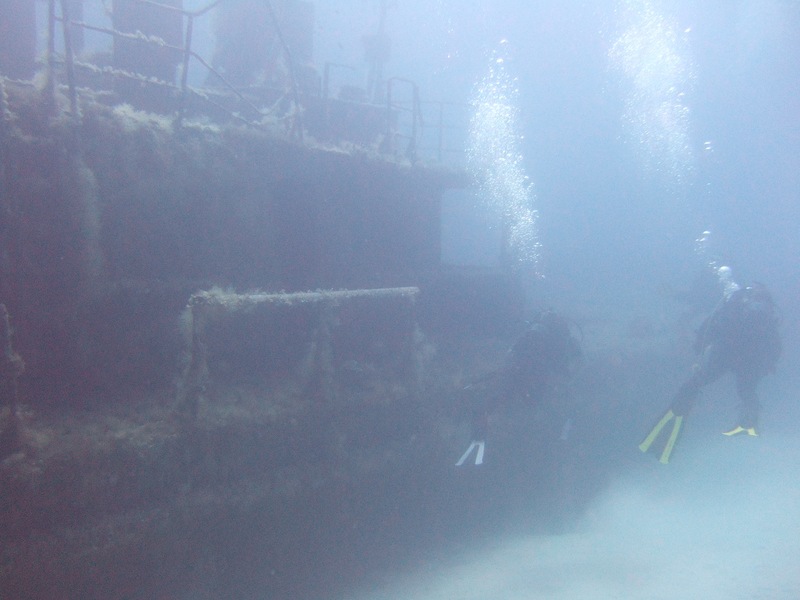 She was cleaned and scuttled on the 25th August 2009 of the Maltese island of Comino at a depth of 18 meters (59ft) to serve as a dive site and artificial reef. This for many was their first experience of wreck diving and for some turned out to be their most favourite dive of the week. 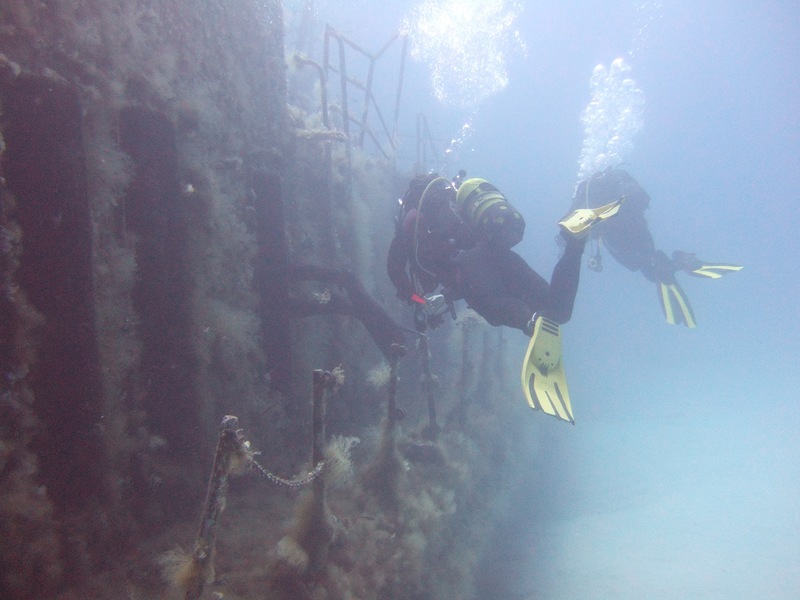 The nature of the wreck allows divers to swim through corridors and rooms to explore its interior including the bridge and the lower holds. It is also home to quite a variety of marine life such as schools of damsel fish, a very poisonous and grumpy scorpion fish and some moray eels. After a break at a local bay called the Blue Lagoon we then moved around the coast to an area known as Comino caves. Due to the prevalence of limestone rocks this dive involves many swim throughs through natural arches and caverns and gave sight to some very impressive light displays from the sunlight piercing the holes in the rocks above. Towards the end of the dive we also had the opportunity to feed some of the local fish life from the bottom of the bay. This brought hundreds of hungry fish in to feed from the divers below. The final day’s diving loomed and with some despondent (and by now quite tired) looks we set off by minibus for our last two dives of the week. Unknown to many these would prove to be the icing on the cake for a great week’s diving. Our first dive of the final day was at a site known locally as ‘The Inland Sea’. 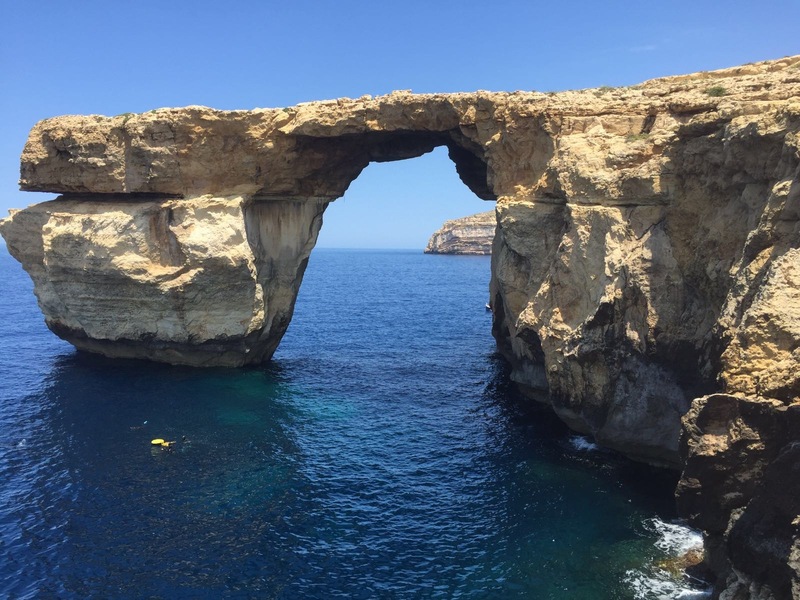 The Inland Sea, sometimes called Qawra in Maltese, is a lagoon of seawater on the island of Gozo linked to the Mediterranean Sea through an opening formed by a narrow natural arch. It was probably formed where a geological fault in the limestone had created a sea cave and the roof then collapsed. On one side there is a gently shelving stony beach with several fishermens’ huts. The boats are often pulled up on to the stony beach. The bottom of the lagoon is also mostly pebbles and rocks and is fairly shallow. As you exit through the tunnel towards open sea, the floor drops away in a series of shelves to a depth of up to 35 metres on the outside. Jacques Cousteau himself said the Inland Sea was among his top ten dives! This was a challenging dive with some of the deepest depth progression thus far which divers had to be aware of for possible decompression penalties if not carefully dived. The dive was a “wall dive” where you follow the sea wall along and observe the fish life around it. There was an abundance of fish life through the dive including some medium sized jackfish (like small tuna) and two large octopus also. The dive was also made slightly more difficult due to having to return into the sea current which meant a little bit more energetic finning was required from all divers. The final dive of the week was my personal favourite dive and a bucket list dive also. 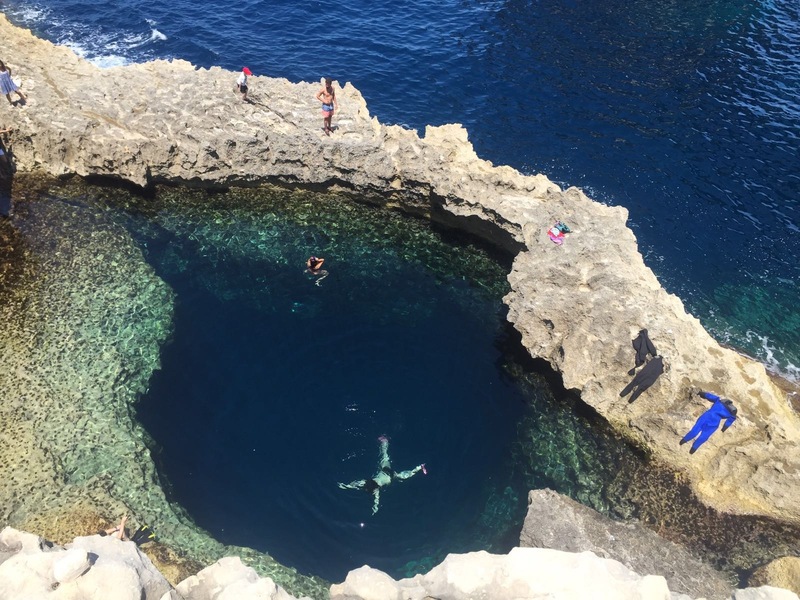 The Blue Hole and Azure Window. 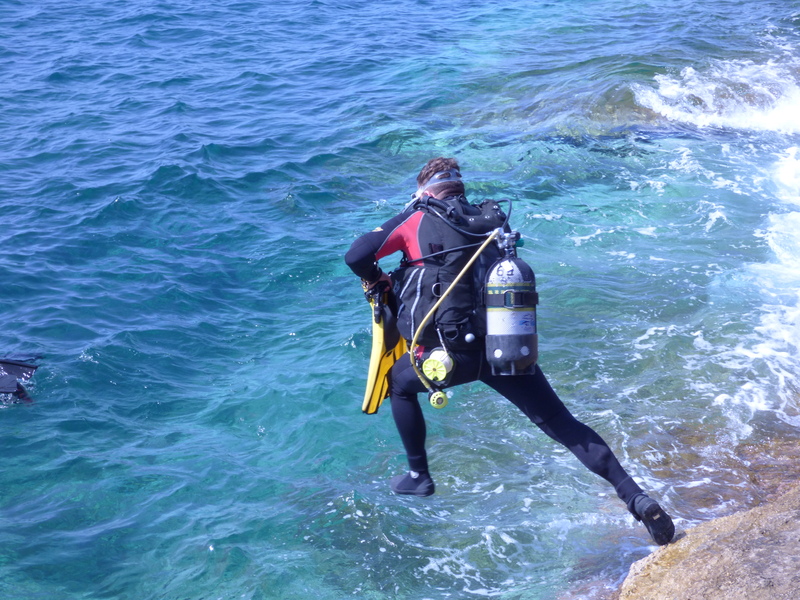 An iconic Gozo dive, the Blue Hole is reached by walking over ancient coralline limestone rocks. The divers entered the water just around from the Blue Hole itself and descended through a natural chimney down through and out into approx 18 metres of water, the divers then moved over some spectacular rock formations with many fish such as parrot fish, jacks and more swimming around them. We then ventured around the back of the Azure Window and were greeted with some spectacular light displays breaking through the natural arch above, as we progressed over to the seaward side entrance of the Blue Hole at around 10 meters. Once in the Blue Hole we explored a large cave that formed at the back of the hole where more fish and one very large moray eel greeted us as we moved around and back to the hole to begin our final ascent of the week. Our last few minutes ascending were spent coming up through the Blue Hole where we could see the tourists and fellow divers above all swimming and looking down at us below. This gave us all a time to reflect on the challenges that we faced during 5 days of diving. Much was achieved with 1 Ocean Diver, 5 Sports Divers and 1 Dive Leader qualification as well as my practical and theory lessons towards Advanced Diver both completed. The exercise allowed me to complete a significant part of my training and gain experience towards my aspiration of completing my SADS course. Hopefully in time it will allow me to plan, organise and run other exercises and share some of my fantastic experiences with my colleagues in the reserves, hopefully increasing their opportunities to sample some of the fantastic experiences to be gained through being a member of the reserves. Written by Private John Parsons RAMC attached to 157 Regt RLC Army Reserve Cardiff.